The underdog, it seems, has finally won. And the underdog in this story is the makhana. It’s all over — from posing at department store shelves, where its natty packaging catches just the right light, to being doled out at parties, airports and even the Shatabdi. The conscious eater, or even the habitual snack-craver, is moving towards the makhana and there is no mystery why. The white balls with brown specks, also known as lotus seeds, or fox or gorgon nuts in parts of Asia, where they are part of traditional medicinal practices, “are low in fat, high in carbohydrates and a good source of protein”. “They are also low in sodium and rich in magnesium, potassium, phosphorus, iron, and zinc. That’s probably why lotus seeds are gaining popularity,” says nutritionist Ishi Khosla. Like a chameleon, the makhana takes on the tang of anything it interacts with, making it easily pairable with other ingredients. 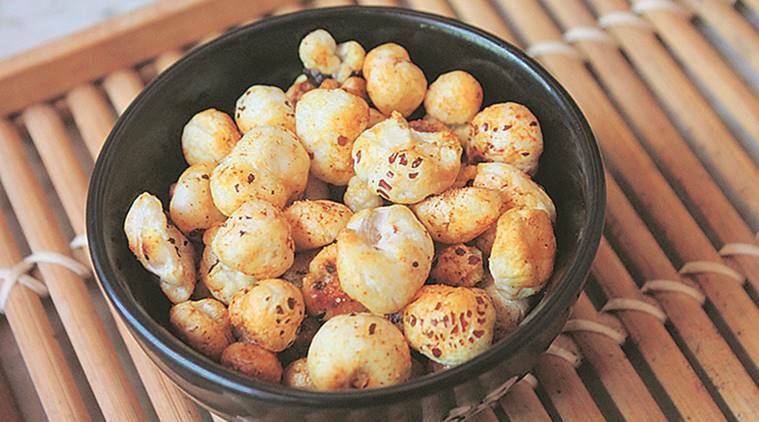 This turned out to be of advantage to retailers who are now dishing out toasted makhanas coated in a variety of flavours — cheese, mint, caramel, wasabi, chocolate, barbecue or just with good ol’ chaat masala, among many others. The owners of Sattviko, Prasoon Gupta and Ankush Sharma, foresaw the trend and its huge potential as a healthy snacking option in 2015. “I have memories of my mother eating makhana while fasting and that’s largely how it was perceived. We wanted to modernise this superfood for today’s consumer. So, we came up with a few flavours like pudina, herb and cheese, and peri-peri and introduced it in the market in retail packs as snacks. The product picked up. I think it’s taken people’s fancy primarily due to its intrinsic benefits,” says Gupta. Part of chef Manish Mehrotra’s menu, in New Delhi and at Indian Accent’s New York outpost, in dishes such as the Mixed Vegetable Tart and Matar-Makhana Malai, and Vikas Khanna’s New York restaurant Junoon’s offerings as Nadru Matar Makhana, lotus seeds have been striking it in the fine-dining space as well. But before the heady ascent of the humble makhana, it was largely consumed “in bania-kayastha households as sabzis such as mawa, matar and makhana, where they are dry roasted and then added to a gravy which might be tomato or curd-based or as a dessert in a variant of kheer. Makhane ki kheer, one of the most popular makhana preparations utilises the pods in two ways — intact or crushed,” says food historian, Pushpesh Pant. “Makhanas are also part of certain traditional practices. For instance, in the Maithilanchal region, it is included in the special preparation for the son-in-law when he visits his bride’s home for the first time, along with maach and paan,” he further adds. Since it is cultivated in low-land ponds in-and-around the state of Bihar, the makhana has been a salient component of the Bihari thali. Usually roasted and seasoned (like in Punjab), the makhana also features as a halwa, in dishes such as methi-makhana-mutter, shahi makhana, and makhana-maachh in Maithili cuisine and is also offered as prasad to dieties during the Yajna and Pujana festivals.